For just as the human body is one and has many members, and all the members of the body, though many, are one body, so it is with Christ (whatever the church/we, in its/our sinfulness, may choose/s to express). For in the ONE Holy Spirit we were all baptized into ONE body — white or aboriginal, rich or poor — and we were all made to drink of ONE Holy Spirit. Now you (PLURAL, all of you, together) are the body of Christ and individually members of it. And God has appointed in the church first apostles, second prophets, third teachers; then deeds of power, then gifts of healing, forms of assistance, forms of leadership, various kinds of tongues. God appoints, God chooses. Are we listening carefully? Are all apostles? No, that would be too many. Are all prophets? No, we have a hard enough time with the ones we already have. Are all teachers? No, but we could use a few more! Do all work miracles? Hmm… You see, we do need others after all. Do all possess gifts of healing? That would be great! But do we even recognize those who are already among us, the healers already at work? Do all speak in tongues? Not in our part of the household of faith, probably, but, remember again, it’s much bigger than us! Do all interpret? No, they don’t, although more probably could, if they set heart and mind to it… But strive for the greater gifts. And what might those be, Saint/Brother/Father Paul? What is that more excellent way? What’s that you say? That’s not just about Jesus? It’s about me? About us? 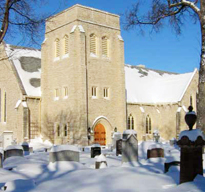 About the people of St. John’s Cathedral, Winnipeg, and the Diocese of Rupert’s Land and the Anglican Church of Canada and the Anglican Communion and the whole household of faith, the Oikoumene, the whole body of Christ in the world? Ah, I see, and that brings us back to where we began, doesn’t it?